Background: Laparoscopic transabdominal adrenalectomy (LTA) is the most common procedure for the surgical treatment of adrenal tumors. Although the retroperitoneoscopic adrenalectomy (RPA) is becoming more common, few studies have examined the safety and outcomes of both procedures. Objective: To compare the safety and surgical outcomes between LTA and RPA. Methods: Retrospective review of 142 patients undergoing laparoscopic transabdominal or retroperitoneoscopic adrenalectomy at an academic medical center over seven years. Patient demographics, tumor size and type, operative time, length of hospital stay and surgical outcomes (conversion, complications) were compared between two groups. Statistical analysis was performed using the Student’s t-test and statistical significance set at a level of 0.05. Results: 142 patients underwent 153 adrenalectomies from 2000 through 2007. LTA was performed in 129 patients and RPA in 13. Indications for adrenalectomy were hyperaldosteronism (64), hypercortisolism (30), pheochromocytoma (22), nonfunctioning adenoma (1), and others (9). Outcomes are summarized in the table. 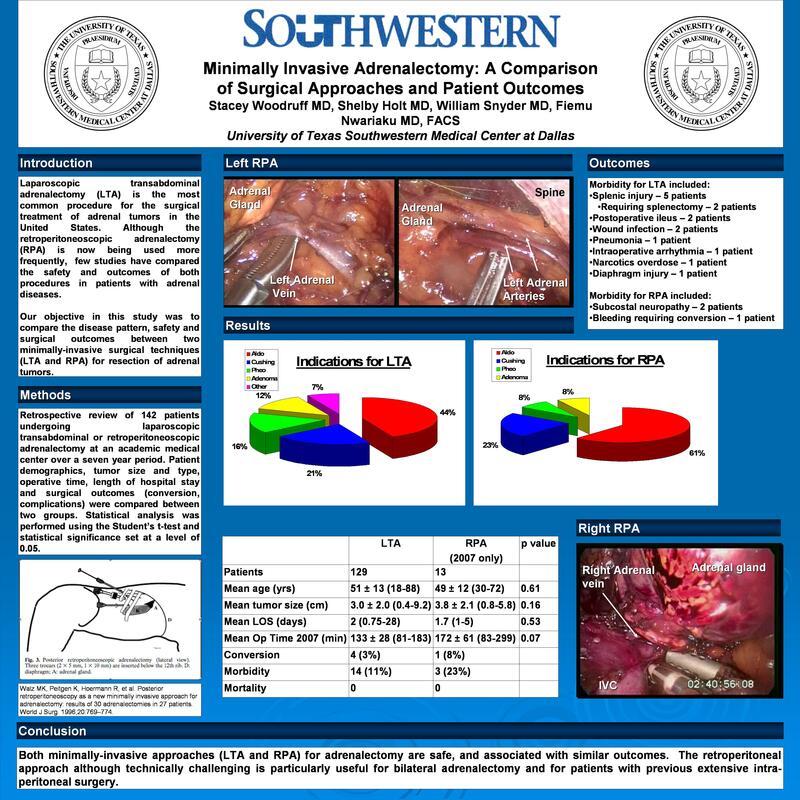 Morbidity for LTA was 11% and included splenic injury (5), postoperative ileus (2), wound infection (2), pneumonia (1), arrhythmia (1), narcotics overdose (1), and diaphragm injury (1); for RPA 23%, including subcostal neuropathy (2), bleeding requiring conversion (1). Mortality was zero. Conclusion: Both LTA and RPA are safe and associated with excellent outcomes.